Hey everyone, got a game pitch for ya. Game is called Monster Battle. I know the name seems bland but one of my design philosophies is show don't tell. I try to let this shine through the nomenclature when I can by giving things seemingly bland names but exciting or interesting implications. AnywaY!!! The plane around man shifts nebulously. and made excursions into the labyrinthine Library. march for war into the lands of Goblin and Man. Beast and Bird, Flora and Fauna, Slime and Spirit. Man and Dragon, Goblin and Orc. The current concept is a 1v1 "Hero" based card game where the player chooses from a variety of "hero classes" with their own abilities/suite of cards unique to them and then duke it out. Th object of the game is to reduce the opposing "hero"'s health value to 0 before either player decks themselves. When a player runs out of cards in their deck, they are allowed one more "final breath" turn before their hero passes out form exhaustion and they lose the game. Pretty standard fare. The unique hallmark of the game is it's "resource" system, emphasis on card positioning, and the way cards interact and link with each other. Completing affinities is integral to Monster Battles' strategy. Many cards require no affinity to be played but have very basic effects. More advanced and powerful cards require you to control specifics sets and colors of affinities. For quick reference, most "spell" or "magical" effects use blue, "skills" or "abilities" typically require green affinities, and "power" or "attack" generally need red affinities. Some cards may also have a yellow affinity link. Yellow affinity links can complete any color of affinity. 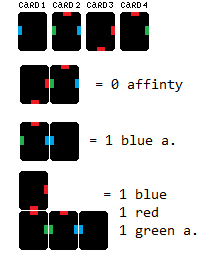 Completing an affinity with 2 yellow affinity links creates a "wild card" or "rainbow" affinity that counts for any one color but only one at a time. Players will take turns playing Artifacts, Monsters, Spells, and Abilities. These are all distinct card types. There is also a special card type called the "Hero" (name not final) which represents the player. Cards also have a "rarity" associated to them. If I ever made a production of the game, the actual rarity of the card doesn't matter from a collectors perspective as I would go the Living Card Game route and give you a playset of all cards in a sinlge "big box" purchase, though grand production is a pipe dream at this point. For the moment rarity serves as a deck building restriction; cards that are "Legendary" are unique and powerful cards. There may only be 1 (ONE) Legendary card per deck. Not one copy of each, just one full stop. Decks may have any number of "Rare" cards in them, though only 1 copy of each. Likewise, "Uncommon" may have 2 copies and "Common" 3. Heroes are the character or commander card which represents each player. The object of the game is to reduce the enemy Hero to 0 health points. This is accomplished by attacking the opposing Hero with your own Hero, attacking them with your Monsters, or using the effects of cards to deal damage to your opponent. Hero cards determine a lot of the play style for the player. First, heroes are played on the top row of the game board and have a fixed position. I haven't decided if the player gets to choose the position at the start of the game or if the card itself has it's own unique orientation yet. Likewise I haven't decided if each hero will have the same attack or health values. These details are still being ironed out. As with most cards, Heroes also have affinity links. Be mindful of these when positioning your cards and building your deck! Heroes will also have an associated "class". Classes have their own suite or cards they can use to make each hero have unique deck building options as well as being able to use neutral cards. This thread is a WIP. Those affinity arrows are nice, reminds me to the Link Markers from Yu-Gi-Oh! Hello! I read over your idea and you are on to some good stuff. The restricting of cards is a really great way to keep the balance in the game. The resource system is very unique and reminds me a lot of those mini-games in Final Fantasy 8 and Final Fantasy 9. There is no harm in having a game that does not require a lot of cards, these games play faster and are easier for players to get into. You should make some demo cards to expand on the idea more.